SEAT has given its family crossover some hot hatch appeal with the launch of the Ateca FR. The souped-up SEAT will go on sale in the summer for an estimated £28,000 and feature larger wheels, sporty bodykit and the option of the Spanish firm's 190PS petrol engine. 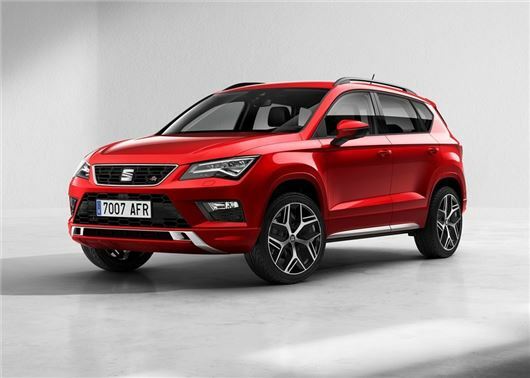 The SEAT Ateca FR is thought to be the precursor to a full fat Cupra model and boasts some notable updates, including 18-inch ‘Performance’ alloy wheels, colour coded side skirts and a rear spoiler. The bumpers have also been reworked, with sleeker lines, while the roof rails, window frames and front grille are all finished in matte black. Inside the FR makeover provides the Ateca with sports seats, leather steering wheel and a generous scattering of red FR logos and stitching. Aluminium pedals are also included, while sports seats can be optionally finished in leather. The FR trim level will be available on petrol and diesel models and power ratings vary from 150PS to 190PS, including SEAT's latest 2.0 TSI 190 unit. As with the standard Ateca, buyers can choose from manual and DSG auto transmissions and four-wheel-drive will be available on both 2.0 TDI engines, plus, the new 2.0 TSI. The new FR trim will sit above the S, SE and SE Technology trims, but below the halo Xcellence versions. There are no details on pricing, but we expect the SEAT Ateca FR to start in the region of £28,000.